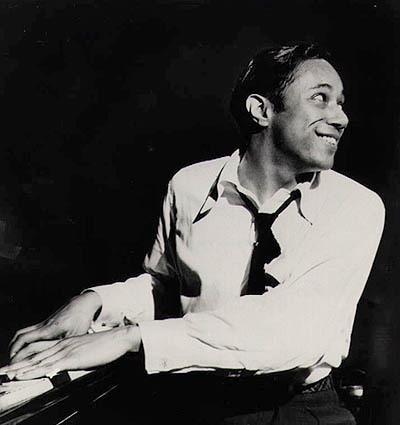 Thanks to Horace Silver, the magical moment occurred shortly after I first moved to New York, one of many that effectively, resoundingly, shot down (or made me re-consider) all my country Midwestern notions about…everything. I’d say I was hooked from the moment I heard that sneaky vamp. “Come on Home” was the first cut on Lambert, Hendricks and Ross’s High Flying with the Ike Isaacs Trio, and Horace Silver’s music built from there into something that I can only describe as a wild party for the ear, aided by Jon Hendricks’ comic lyrics and the group’s out-of-this-world syncopated vocal stylings. This was jazz singing I’d never heard before—years later, I still look back an recognize that moment as one that made me more aware of music’s possibilities than anything I’d learned in school, or on stage. Do yourself a favor—track down the CD (compediumized, surely—Columbia combined it with 3 other LH&R LPs a few years back) and toast the great Horace Silver’s work, which also includes “Cookin at the Continental” and “Home Cookin’”. Pleasure awaits-RIP.